BAY FRONT. Fantastic three-bedroom house with sweeping bay views. Walls of sliding doors open onto the large pool and hot tub deck with big bay views. Living room with fireplace. Gourmet eat-in kitchen. Large bay front master suite. Two additional bedrooms share one nice bath. Central AC and heat. Bay front beauty! This gorgeous home is available for a B-side. Lovely four bedroom house fully air conditioned with three baths. Gorgeous bay side outdoor living room, large pool, hot tub, spectacular living room that opens up to the bay, amazing sunsets, and close to town. Pines Harbor Realty?s latest Exclusive. This wonderful house has come onto the rental market. Built in the grand tradition of ?Pines? specific architecture. This masterpiece has all the components. Large living areas with soaring ceilings and walls of glass. Open kitchen with large dining area. Two living rooms, one off the pool, another one upstairs.Four full bedrooms share three full baths. Plus a nice maids room. The roof deck has unobstructed 360 views. Large sunny pool. Wonderful outdoor spaces. Plus additional fifth bedroom . One of the finest houses to rent. All new. A recent construction that boasts a gorgeous kitchen with all top of the line appliances, a great and spacious living and dining area, roof deck with beautiful views, and a prime location. Newly renovated. New pool. 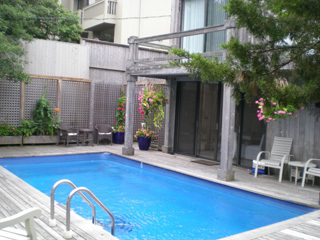 Lovely Fire Island Pines beach house available for the summer. 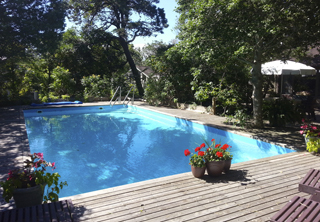 This house is in a perfect location, close to town and close to the beach. Nice living room with fireplace. Open kitchen. Charming wooded back yard. Two bedrooms share a full bath. Outdoor shower. Very nicely maintained. Pines Harbor Realty presents one of our many beautiful rental exclusives. 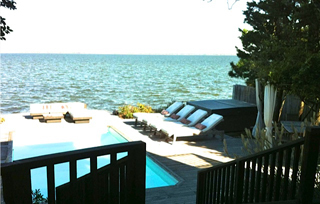 A true Fire Island Pines classic beach house. Keeping in tradition with the look. Classic 3 bedroom, 2 bathroom in great condition. Sleeps 6. All-cedar interior feels like a cozy cabin. Large central room with double-high vaulted ceilings and built-in couch. Two queen bedrooms downstairs and a 'crow's nest' full-size bedroom on the second floor. Topped off with a roof deck. 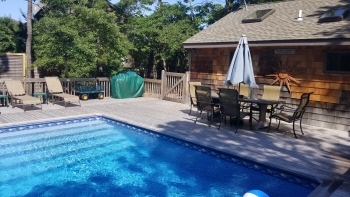 Private wooded property, outdoor shower, wood burning fireplace, great sound system, wifi, double height ceilings in the living room, WBFP, and an extra large sunny pool deck.